Daniel Suter has become the latest player to commit his future to the Ospreys by signing a three-year contract. 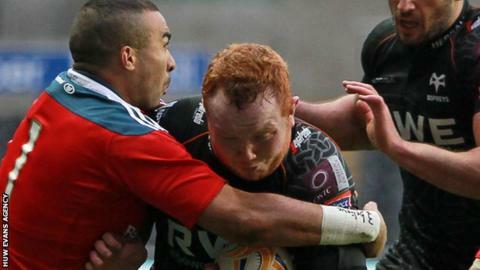 The 20-year-old tight-head prop is the 11th player to sign a new deal with the Ospreys since the start of 2012. Suter is the fourth forward in 72 hours to commit to the region along with South African Rynier Bernardo,Dan Baker and Nicky Smith. "I'm very pleased to have signed a pro contract" said Suter. "All I've ever wanted is to get out there and play for the Ospreys, testing myself against top quality opposition. Hopefully I haven't let anybody down when I've had the chance." Suter was part of the Wales Under-20s team in 2013 which was the first Welsh team to reach the final of the Junior World Championships in France. Andy Lloyd, Ospreys' rugby operations manager, paid tribute to Suter's character, describing him as an example to his colleagues. "Daniel is someone who works hard, has a tremendous attitude, and just seems to get better every day," said Lloyd. "We've watched him really develop in this environment over the last two or three years and his work ethic is an example to other young players. "Daniel is one of an exciting pool of young props at the region who have come through the development pathway to give us significant front row depth."